Last week, while driving to work, I heard Dave Lieberman was going to be at Macy’s Lakeside Mall in Sterling Heights. Dave hosts a couple shows and webisodes on Food Network. I thought to myself “hmmm..I’ll try emailing them and see if I can get an interview!” So I emailed him and waited for a response. And waited. And no response ever came. No worries, I thought. I’ll just go there anyway and see what happens. On Saturday, Chris stopped by to pick me up. The book signing was at 1pm and at about 12pm I was still getting ready. Traffic on the roads was busy, there was an accident on the I-75 and neither of us had ever been to Lakeside Mall. It was 1:45pm when we finally did get there, ran over to the cookware section, saw Dave Lieberman, asked the sales lady where to get a copy of his book and found out you can get his new book by purchasing $50 worth of goods. Instead I ran over to the nearest bookstore only to find a woman purchasing the last copy. Head back to Macy’s, find out that I could purchase the Macy’s cookbook that happens to have Dave Lieberman in there and he will sign it. 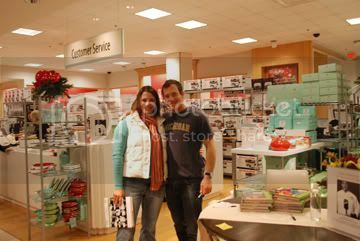 The sales lady shuffles me over to Dave to have my book signed. He says hello and I hand over my book. At this point, I’m completely frazzled. So the only words I can utter are “I really like your webisodes”, snap a picture and it was over. I really like your webisodes??? Wow. Where did that come from and why couldn’t I have thought of anything better? I’m sure he thought I was either a star struck fan or a weird stalker. Rachel Ray is coming to Birmingham, MI in December for a book signing. I’ve emailed her in hopes of getting an interview. Let’s hope they at least write me back.